That's quite a claim, because Mike Brown of Caltech is no stranger to this part of our cosmic neighborhood. After all, he discovered Eris, an icy world more massive than Pluto that proved our old friend wasn't special enough to be considered a full-fledged planet. He also introduced the world to Sedna, a first-of-its-kind dwarf planet that's so far out there, its region of space was long thought to be an empty no man's land. 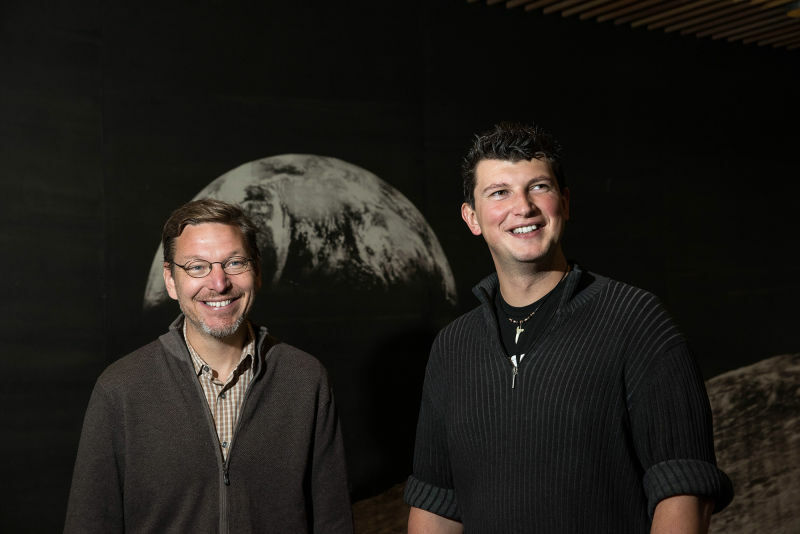 Now Brown has teamed up with Caltech colleague Konstantin Batygin to do a new analysis of oddities in the orbits of small, icy bodies out beyond Neptune. 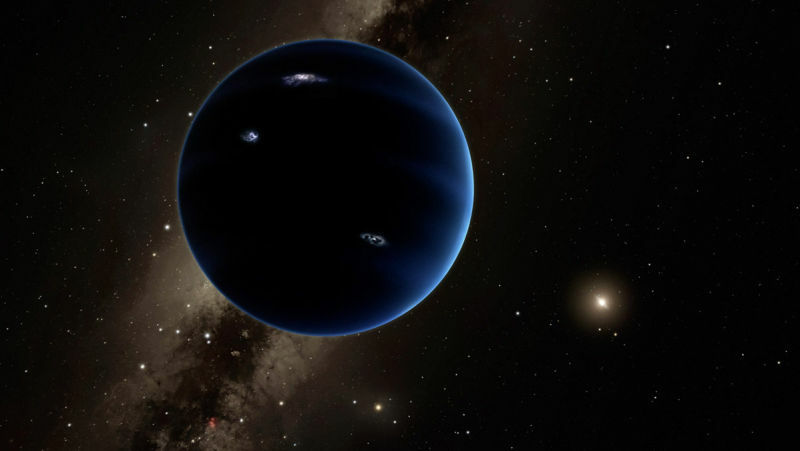 In their report published Wednesday in The Astronomical Journal, the researchers say it looks like the orbits are all being affected by the presence of an unseen planet that's about 10 times more massive than Earth — the size astronomers refer to as a super-Earth. "I'm willing to take bets on anyone who's not a believer," says Brown. He thinks existing telescopes have a shot at spotting this mystery planet in just a few years, since this new study points to a band of sky where astronomers should look. The first suggestion that something big might be affecting the orbits of distant, icy bodies came in 2014. An international team of astronomers announced that they'd discovered a new dwarf planet, nicknamed Biden, that stays even farther out than Sedna. They also noted a strange clustering in the orbits of these objects, and in the orbits of about a dozen others. Perhaps, they hypothesized, the gravity of some unseen planet was acting as a shepherd. "They were pointing out that there was something funny going on in the outer solar system, but nobody could really understand what it was," says Brown. "Ever since they pointed it out we've been scratching our heads." 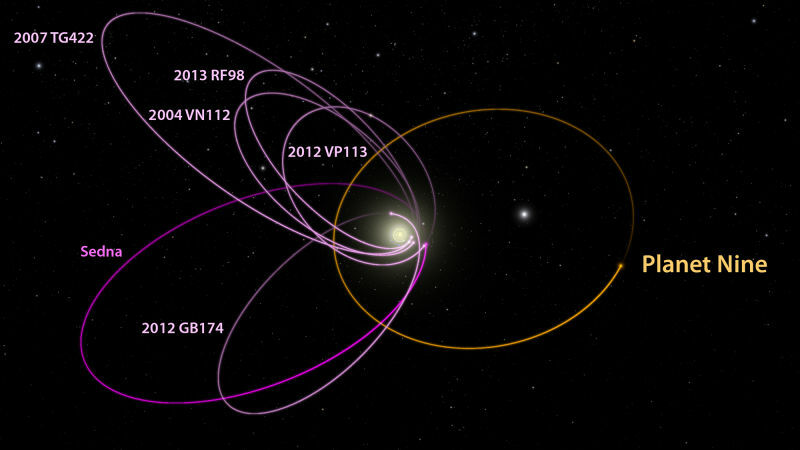 What's more, this planet naturally explains why the dwarf planets Sedna and Biden have weird orbits that never let them come in close to the solar system. "This wasn't something we were setting out to explain," says Brown. "This is something that just popped out of the theory." "They're objects that nobody has really explained or tried to explain before," says Brown. "My jaw hit the floor. That just came out of the blue. Being able to make a prediction and having it come true in five minutes is about as fun as it gets in science." "I want to know what it's like. I want to see that it's really there," says Brown. "It will hurt when somebody finds it and it's not me — but I assume it's going to happen, and I'm willing to feel that pain." Still, he's not completely convinced. "We really need to find more of these objects — more of these small objects that can lead us to the bigger object," Sheppard says. "I think it's still a tossup if it's really out there or not. I think we just need more data. Hopefully within the next few years we'll really be able to nail this down." Dwarf planets like Sedna and Biden are not exactly household names. But Sheppard says if the solar system indeed has an honest-to-goodness ninth planet — a distant, giant planet that's bigger than Earth — "that, I think, is something that would blow the mind of anyone here on Earth."